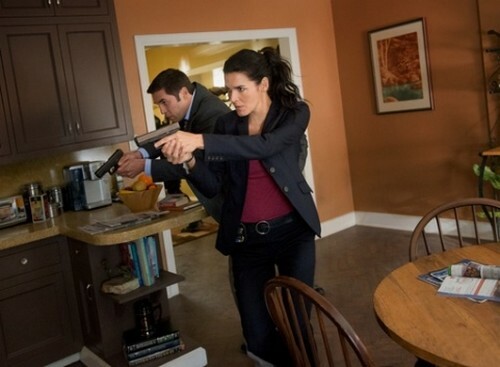 Tonight on TNT RIZZOLI & ISLES returns for another episode in its fifth season called, “Doomsday.” On tonight’ episode the team investigates when a man is found murdered inside his doomsday fallout shelter. Jane loses investigative focus when she discovers Korsak is considering retirement and Frankie is hiding a secret. On the last episode a killer was using online ads to find the perfect candidate for murder: men no one will notice are missing. Meanwhile, Jane discovered that keeping her pregnancy quiet was going to be a tough assignment. Did you watch the last episode? If you missed it we have a full and detailed recap, right here for you. On tonight’s episode when a man is found murdered inside his supposedly impenetrable doomsday fallout shelter, the squad must figure out how and why he was targeted. Jane finds it difficult to focus on the case when she discovers Korsak is looking into retirement and Frankie is keeping a secret of his own. Early that morning, a man went into his very own impenetrable doomsday fallout shelter and sadly never made it out. Peter Baldwin was 35 and lived alone but for some reason he felt he needed the protection of a shelter. Though he didn’t start out in life as one of the cranks. He only got into the whole end of the world thing after his wife died from tuberculosis. Since then he’s been afraid of airborne toxins and possible chemicals in the air. Which kind of made his death that much sadder. Peter died from carbon dioxide poisoning. However because there tends to be warning signs of such an event before it actually kill someone – his death is being written down as suspicious. Maura won’t say anything else till she gets the body back to the lab. Back at the office, Jane’s mom manages to corner her daughter long enough to get a word in. Angela is worried about her other child, Frankie. And she wants Jane to give him one of her big sister’s talks in case it can get him to open up to his mother again. Particularly now that she feels like he’s dating someone and is hiding that girl from his mother. Jane did get around to trying into talking to Frankie, but she failed to mention his dating life. Why not? Well, she got caught questioning Frankie once realized he has some insider knowledge on these doomsday people. Frankie has followed these people on their forums and even thinks they might have a point. And he’s not the only one. Maura likes the practicality of having a doomsday bunker. When she went to interrogate the man that built Peter his – she kept making plans on what her own would look like. So far she wants to make sure there’s enough room for her and her shoes. But more important that losing her two closest friends and family to doomsday theories if the fact that Jane found a retirement packet on Korsak’s desk and she’s angry he hasn’t said a thing to her. Then again she doesn’t necessarily know his real age. So maybe retirement is something he needs to do. Maura told Jane to just ask him. If she really wants answers on why he would choose this very moment to retire, after they lost Frost, then she has to ask Korsak directly. It’s not anyone else was going to give her the answer. So that what Jane did – she asked and her boss claimed he wasn’t retiring. Although he is upset with her for digging around his desk. He doesn’t when she became this nosey. Though he is using his frustrations with her to get out of answering why he had retirement packet on his desk. They both went back to Peter’s house to have a second look around and while they were arguing – a bomb went off. And despite the bomb (and near death experiences) healing the difference between Jane and Korsak; the detective are more concerned about the body they found in the rumble. The man that built Peter’s bunker, Bob, was found dead at the site. Technically there’s a special name for what he is but opportunist best fits his real description. Bob would build these bunkers and then build a secret door inside of them knowing he could use these doors to later rob his patrons. Seemed like an easy scheme except this time someone was killed. Peter was murdered and the detectives what to know what could have gone wrong in what should have been a victimless crime. Bob had a secret partner in his side business. Someone who would help rob his clients with him and this guy now believes he’s off the hook since Bob oh so conveniently died. But he forgot about the other victims. The ones he didn’t kill when he stole from them. One woman lost 20,000 grand worth of diamonds and yet she use Bob to build a bunk or tell a lot of people about the diamonds. Except for the dealer and her mother there was only one other person left that knew about her husband’s insurance policy – the man who referred her to the dealer to begin. He’s also the guy that called the cops because he was so worried about his friend, Peter. Scott, Peter’s friend, is another doomsday weirdo though he doesn’t like to stockpile the usual way (take stealing from people) or the usual things. When the cops raided his place, they found an arsenal of weapons and bombs. They later caught him hiding in his own bunker but that doesn’t change the weird ending to this case. For people so obsessed with survival – these survivalists were picking each off before the end of the world could even begin. Jane for one thought it was a sad twist though finding out what her brother has been hiding has at least returned her faith in mankind. He isn’t hiding a girlfriend like their mother thought – Frankie is actually studying computers and cyber offences. He knows that he won’t get promoted in their division as long as his sister is still there so he’s making plans for others scenarios. He wanted to be prepared and he so did Korsak. Korsak isn’t retiring just this minute. He merely wanted to fill out the paperwork for when the time comes. So Jane chose to think about her baby’s future and that’s why she’s given guardianship in the event of her death to Maura.